Story of the Week: Is He Living or Is He Dead? 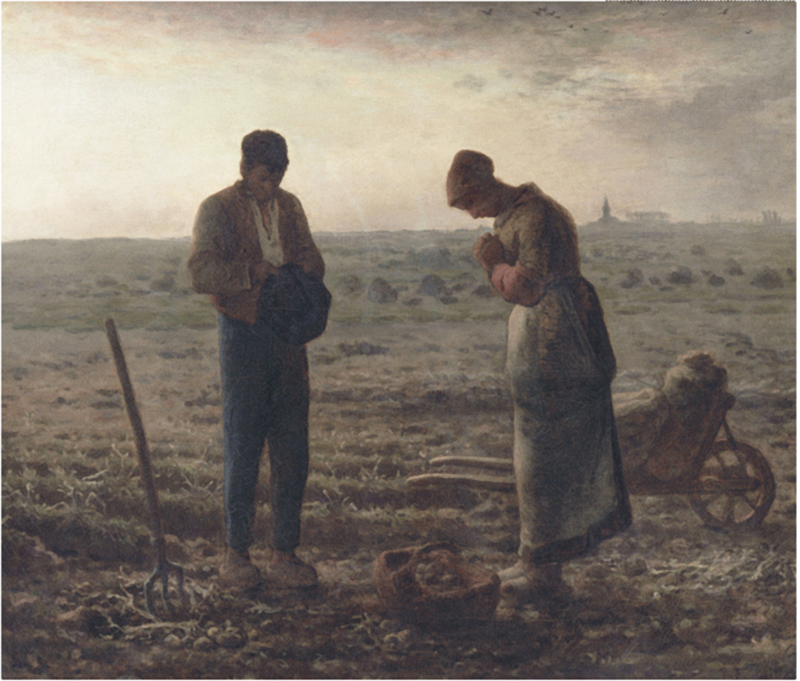 The Angelus, 1859, oil on canvas by French artist Jean-François Millet (1814–1875). Courtesy Musée d'Orsay. The painting depicts two peasants working in a potato field and pausing to recite the Angelus, a Catholic prayer said in early morning, at noon, and in the evening. In the distance a church bell rings the end of the workday. Both Millet and this painting are central to Mark Twain’s satirical story. 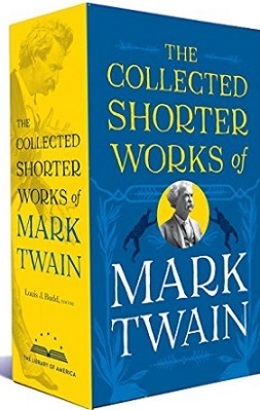 The recent news that David Hockney’s Portrait of an Artist (Pool with Two Figures) sold for $90.3 million, setting a record for a painting by a living artist, brought to mind another record-shattering art auction that inspired a short story published 125 years ago by Mark Twain. In 1889 The Angelus (L'Angelus), a painting by Jean-François Millet, went up for sale when its owner, Eugène Secrétan—the French tycoon who donated the copper to make the Statue of Liberty—lost his fortune after attempting and disastrously failing to corner the market on the metal. At the subsequent auction of Secrétan’s valuable art collection, a bidding war between French and American buyers drove up the price for The Angelus to 553,000 francs. The winning bidder represented a consortium hoping to acquire several pieces from Secrétan’s collection for the Louvre—but the French buyers weren’t, in fact, able to come up with enough cash. In the end the painting went to the second-place bidder, the American Art Association, a New York auction house and exhibition gallery. The following year, after a seven-city U.S. tour, The Angelus was resold for a then-staggering $150,000 (about 750,000 francs) to French department store magnate Alfred Chauchard, who returned the canvas to France and, when he died in 1909, bequeathed it to the Louvre. During the late nineteenth century Millet’s posthumous fame was not confined to Europe; a mania for his paintings swept America—and their surprising popularity is what propelled the transatlantic bidding war for The Angelus. So both Mark Twain and his readers were very much aware of the facts surrounding the paintings and auctions when he wrote “Is He Living or Is He Dead?” in 1893. Twain’s story was one of a number of items he published that year in Cosmopolitan, providing desperately needed funds while he attempted to save his failing publishing business. It was not enough, however; Webster & Co. would fail the following year and result in his personal bankruptcy. In fact, the play was not consigned to the flames and it instead languished in the archives until fifteen years ago, when Twain scholar Shelley Fisher Fishkin dusted it off and published it for the first time. Adapted for the modern stage in 2007 by playwright David Ives and director Michael Blakemore, Is He Dead? received largely favorable reviews and ran on Broadway for 105 performances in the landmark theater named, of all things, the Lyceum. As it happens, ninety-nine years earlier Mark Twain and several friends went to this same theater to see the now-forgotten hit play Love Watches, starring 23-year-old Billie Burke (yes, that Billie Burke), whom Twain idolized and who was often among the parade of visitors in his Manhattan apartment during the final years of his life. Note: The Hans Christian Anderson story described in the opening scene is “The Daisy” (1838). I was spending the month of March, 1892, at Mentone, in the Riviera. . . . If you don't see the full selection below, click here (PDF) or click here (Google Docs) to read it—free!